Astronomers have found more real-life versions of Luke Skywalker's home planet Tatooine from "Star Wars" — alien worlds that see two suns rise and set each day instead of one. And these two newfound worlds are also extremely close to the habitable zones of their parent stars, scientists say. The discovery cements what appears to be a new class of twin sun alien planets and may help astronomers estimate how many of such binary stars possess planets. The finding also suggests that many planets might lie in the habitable zones of such systems, researchers said. Astronomers used NASA's Kepler space telescope to identify the two so-called "circumbinary planets" amid 750 systems they sampled. Their discovery brings the total number of confirmed double-sun worlds up to three. The first, called Kepler-34 b, is about 22 percent of the mass of Jupiter (the largest gas giant in our solar system) and 76 percent the width of Jupiter. 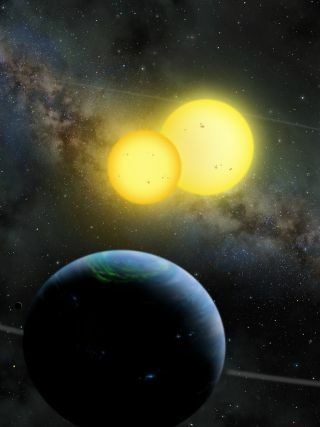 Kepler-34 b orbits two sunlike stars once every 289 days at about the same distance as Earth is from the sun. The planet is located about 4,900 light-years from Earth. The second planet, called Kepler-35 b, orbits two stars that are 5,400 light-years from Earth. It has about 13 percent the mass of Jupiter and is 73 percent as wide. It and orbits its parent stars, which are slightly smaller than the sun, once every 131 days from a distance about 60 percent that between Earth and our sun. These orbits place these planets very near the habitable zones of these stars — that is to say, it is neither too hot nor too cold for liquid water to form on a planet's surface in these regions, meaning that life as we know it could in principle gain a foothold there. "With only three circumbinary planets known, we are already very close to that special 'Goldilocks' zone," study lead author William Welsh, an astronomer at San Diego State University, told SPACE.com "It is my opinion that circumbinary planets in the habitable zone will turn out to be fairly common, and that is exciting." The scientists presented their research today (Jan. 11) at the 219th American Astronomical Society meeting in Austin, Texas and detailed their findings in this week's online edition of the journal Nature. In a separate study, also appearing in Nature and at the AAS meeting today, astronomers unveiled a new analysis that suggests our Milky Way galaxy is home to at least 160 billion alien planets. Most sunlike stars in our galaxy are found in pairs known as binary systems. Scientists discovered the first planet orbiting a binary star system last year using theKepler space observatory. That circumbinary planet, Kepler-16 b, is located about 200 light-years away. All the circumbinary planets seen to date are very close to the critical distance when their orbits would be unstable. "If they were only 20 to 25 percent closer to their stars, the gravitational tugs of the two stars would build up over time and eventually make the planet's orbit so wild that the planet would be ejected into deep space," Welsh said. Given the rate of circumbinary planets seen to date, the scientists estimate about 1 percent of closely linked binary stars have giant planets circling around them. This suggests our galaxy is home to at least several million circumbinary planets. "There are lots of these circumbinary planets — they are not the rare beasts that they might have been," Welsh said. "That tells us that nature likes to form planets, even in chaotic environments close to two stars." "I am going to stay focused on the hunt for more circumbinary planets," Welsh added. "It's by no means easy, but I expect we will find more of these gems in the Kepler data."